TheaterSeatStore is proud to announce it's latest new exclusive introduction from Palliser - the Atomic theater seat with a tray table. The Atomic offers similar styling to one of the industry best sellers - the Pacifico - but adds one more exciting feature - the tray table. The table fits securely into a brushed steel grommet on the front left arm rest of each recliner, just before the cup holder. The demand for features in home theater is growing and storage and tray tables are highly sought after - along with power recline and lighted cup holders. As with all Palliser models, this seat is available in black and brown premium top grain leather with perfect lower exterior matches, with power or manual recline options. Custom order in other leather and fabric colors will be available in the not too distant future. 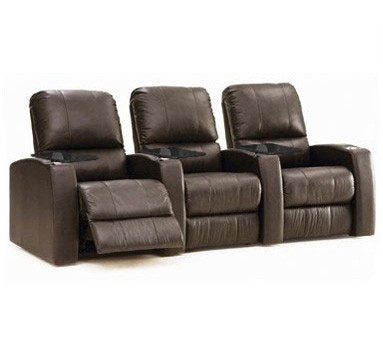 An industry leading warranty protects the frame, power recline and material covering ensuring complete peace of mind. The black or brown leather manual recline versions will start selling for $579 including shipping with a $100 up charge for the power versions. Very Nice Article Submitting i like this and The styling of the Atomic would work well in both classic and contemporary settings. I shred to my facebook friends.